Much of Frayn’s writing is taut and beautiful, full of intricate references that circulate and play off each other like clockwork. It’s easy to see why it won the Tony Award; intelligent enough and accessible enough to make the audience feel smart, it marries the thrill of universal discovery with the sick feeling of planetary responsibility, wrapped up in the age-old story of a student/son trying to impress and surpass his teacher/father. One issue with the play, however, is that, like its characters, it’s often smugly aware of its own intelligence. Some sections make little attempt to disguise they are exposition-heavy infodumps, and some stretches get downright ponderous, particularly the first half hour. This is not helped by a number of Katryna Darychuk’s directorial choices, such as actors standing portentously upstage towards the giant mirror which covers the back wall to deliver their messages via eerie vocal reverb, the use of a projection to hammer home a point that had already been made more elegantly, or the sheer space between the characters, which works very well on a conceptual level, but less on a performance level. There is a cut-out circular black void, or nucleus, in the centre of the stage, that feels a particularly relevant image with this week’s release of the first black hole photographs. The actors orbit this central black hole like parts of an atom, which is an appropriate, interesting choice; it’s just hard to sustain the same interest over almost three hours. 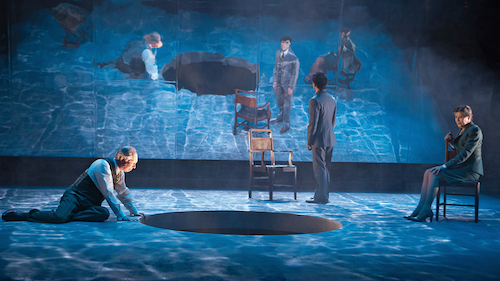 Aesthetically, the set (Lorenzo Savoini) is quite beautiful, with its colour palette and the mirror creating essentially a blurred, watercolour version of what is on stage, hinting at the ability of memory to distort our understanding of events. Despite a couple of opening-night jitters with the incredibly heavy dialogue, the actors inhabit the passions and frustrations of characters very well. Matamoros wears Bohr’s weariness like a slightly-rumpled suit (the costumes, by Gillian Gallow, are lovely), barely able to contain his disappointment and guilt through bluster. Ada is both a grown, dangerous man and a petulant child searching for approval. They are both examined and fondly judged by the less-famous but equally-observant third member of the triangle. Given that the piece is 20 years old, it feels refreshing that it features a woman who not only understands the concepts the male geniuses are spewing, due to her endless typing out of her husband’s revisions, but readily calls them on their self-aggrandizing, spurious claims. Kyra Harper as Margrethe delightfully and fully comes into her role by the second act, becoming a central charge instead of an outside orbiter. While the first act feels like a full play in itself, the second act really comes alive, with the characters envisioning important moments from their shared pasts that become a testament to another kind of “uncertainty principle.” Do the two physicists need each other in the room for balance? Are they better apart? Or do both states simultaneously exist, like a kind of Schrödinger’s Cat? The nature of perspective is also thoroughly explored, with the message that it is impossible to objectively see yourself and your own actions when you are the centre of your own world, and that even seemingly exact scientific measurements are impacted by human subjectivity. Like its characters, Copenhagen both fascinates and frustrates, with the positive charge, luckily, far outweighing the negative. Math may be “what sense is,” but as long as math is performed by humans, it may still be fallible – and we may not know, until history unfolds, that our calculations were dangerously off. Copenhagen plays at the Young Centre for the Performing Arts (50 Tank House Lane) until May 4, 2019. Shows run Tuesday-Saturday ay 7:30PM, with Wednesday, Saturday and Sunday matinees at 1:30PM. Tickets are $36-102 and can be purchased online, by calling 416-866-8666, or in person at the theatre Box Office. This production contains the use of haze and strobe lights.